Edith here. 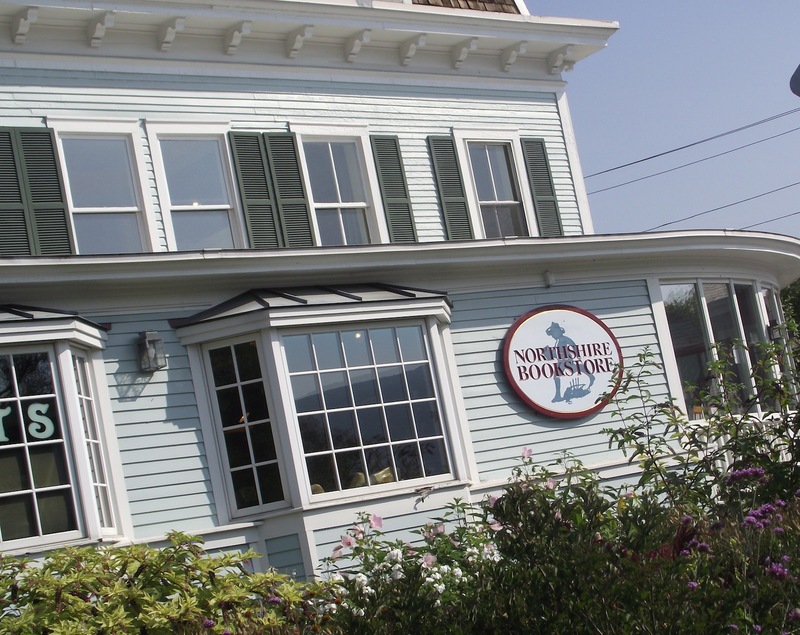 I’m so happy Sarah Knight could join us today to talk about her job at the fabulous and thriving independent Northshire Bookstore in Manchester, Vermont. Author Sara Henry introduced Sheila, Tiger Wiseman, and me to Sarah this summer when we were on a writing retreat at Tiger’s Vermont home. Sarah agreed to visit and tell us all about the different hats she wears on the job. Take it away, Sarah! 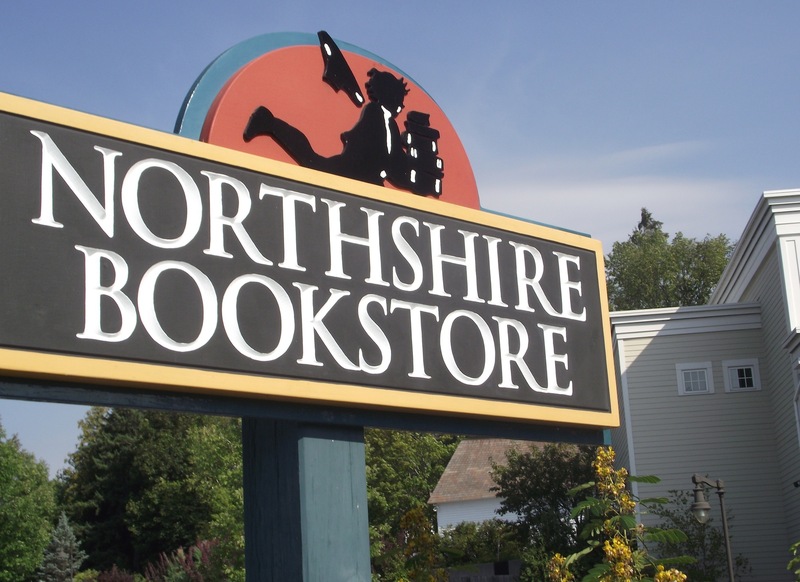 Sarah: My area of expertise at the Northshire Bookstore in Manchester Center, Vermont is as an adult bookseller, the adult book merchandiser, and adult mass market buyer. As a bookseller I’m often asked for recommendations. I have a series of questions I ask to find out what type of books the customer likes to read. I begin with very general questions like fiction or nonfiction, hardcover or paperback. Then my questions become more specific. If it’s a mystery the customer would like to read I ask what was the last mystery the person read and liked. Then I suggest a few titles and, if they like one or two, we’re set. If not, I continue on. As a merchandiser I’m in charge of the displays and work with other booksellers to select interesting titles for our customers to buy. I’m in charge of the mystery section. After listening to cozy readers’ comments and questions, I decided to have a dedicated cozy section within the larger mystery section. This has been very successful and the number of customers who buy cozies has increased. 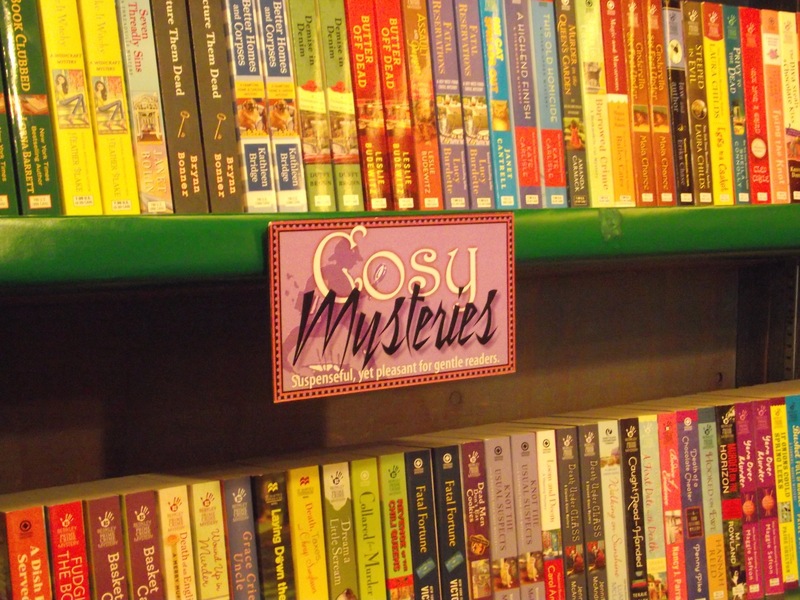 Plans are in with works to enlarge the cozy mysteries both in number of titles and space in the section. Edith: The Wicked Cozy Authors approve, Sarah! Sarah: As an adult mass market buyer, I buy what I think our customers might be interested in both established and new authors. Also, I like to bring in titles that might surprise our readers. I try and buy a variety of cozy mysteries. I order electronically online from publisher catalogs. Edith: How did you start working at Northshire? The sculpture outside the store. Sarah: One evening I mentioned to my husband that, rather than sell Asian antiques, I would like to work at the Northshire Bookstore. The next afternoon on our kitchen table, I noticed a copy of our local paper open to the help wanted section. A big red circle was drawn around an ad for a bookseller at the Northshire. That was 25 years ago and seems like yesterday. Edith: It was meant to be!What are three things we should know about your area of expertise? Sarah: You don’t have to read every book you sell, but it helps to read some of them. If I’ve met an author, I will work harder to sell their books and prominently display them in the store (one of the perks of being in charge of displays). After I met you, Edith, I brought in several of your titles and faced them out. All sold. Edith: Aw, thank you! That’s awesome. Is there a general characteristic that experts in this field all share? Sarah: A general characteristic of booksellers is that they are passionate about books and reading and have homes or rooms that have so many books they qualify to be featured on a hoarders reality show. Edith: What do people usually get wrong when writing about your field? Sarah: Booksellers do NOT get to read while on the job, I repeat, booksellers do NOT get to read while on the job. We are there to sell books to customers to read. Edith: I did not know that! Next question: what is a great idea you’d love to share? Sarah: Find time to read everywhere you go (except when you’re a bookseller at work). 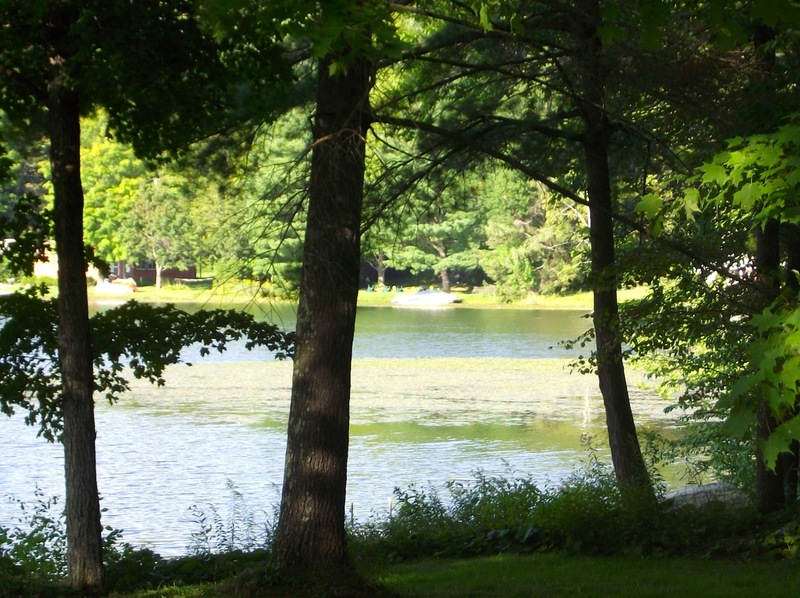 The lake where Sarah wrote these answers. Yes, Vermont is beautiful. Edith: And what are you working on now? Sarah: I am looking for a cozy mystery which features a protagonist who loves adult coloring books that are all the rage now. Any thoughts? I am organizing my advanced readers copies by publication month trying to read them in this order. It’s hard when the publisher sends me an advance copy of a book by a favorite and the book release date in next February. I’m trying to be a more disciplined reader. Edith: That’s sounds like a great premise for a new series if it hasn’t been done yet. Sarah, thanks so much for visiting us. I’m looking forward to getting back to Northshire for another visit. Readers: What else do you want to know about the job of a bookseller, bookbuyer, and book merchandiser? Ask Sarah – she’ll be popping by today to reply to comments. Sarah, what does that sculpture in the yard say (and mean)? I walked past it when we visited but I can’t remember now. And thanks again for joining us today! 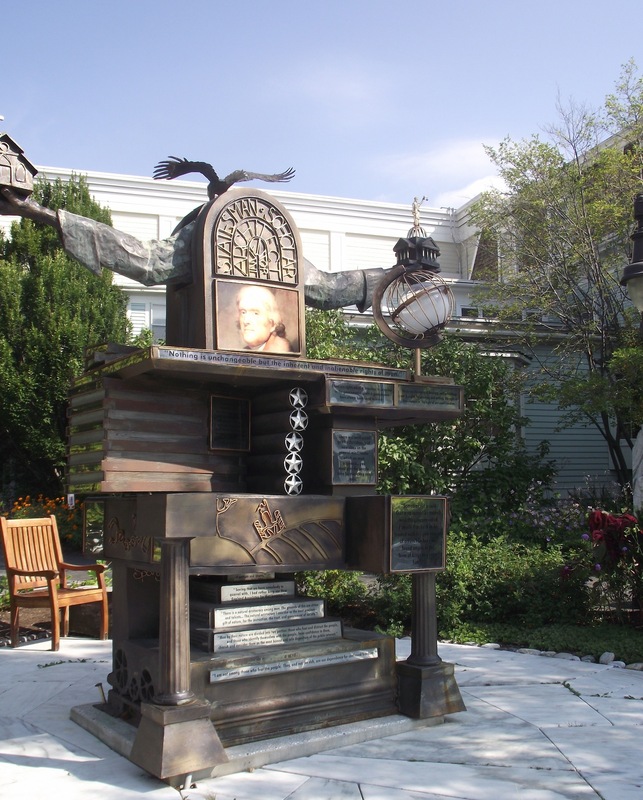 The Thomas Jefferson sculpture with quotes from Jefferson was originally at a The Jelly Mill Marketplace. The marketplace was in an old barn and featured different vendors who sold an array of interesting and wonderful goods from gifts, to gourmet food products and a good restaurant. Ed Morrow, owner of the Northshire Bookstore, bought the sculpture when the Jelly Mill went out of business. It’s been at the Northshire since (except for time away when the artist worked it as the harsh winters had done some damage). What an informative post!! I’d like to know if all independent book stores hire bookbuyers and merchandisers? And if so, what type of experience or education would a person need to be hired as one? Forgive my ignorance on the subject. I assumed that the bookstore owner did all of the book purchasing and dictated the book display choices. This is all very enlightening to me. Thanks for your comments. Staffing at independent book stores depends on the size of the store. The Northshire has about 40 employees as we are a large indie. We have a full time adult book buyer and a full time children’s book buyer. I buy only mass market titles for mystery, romance and horror….a very tiny part of my job which I enjoy. Retail experience is most helpful for a bookseller job as is being an avid reader. While I am in charge of the adult book merchandising I work closely with our book buyer and other booksellers all the time. Forty years ago when the Northshire first opened the owner did the book buying and many other tasks as the store and staff were a lot smaller. Sarah, thank you for the warm welcome when we dropped in unannounced! To anyone who happens to find themselves in that part of Vermont, it’s worth seeking out the store, which definitely has something for everyone. By the way, I mentioned our visit to my Berkley editor Tom Colgan, and he said he’d been there. Do publisher’s representatives ever call on you, or do you have to work from their catalogs to make your choices? And how on earth do you choose? It was fun meeting you. We refer to your visit as “the day Sara J brought the cozy authors to the store”. Thank you for your kind comments. Publisher reps see our head buyers, Stan and Jessica, throughout the year. I spend most of my time on the sales floor and as the mass market buying is only a tiny part of my job I order electronically. I do talk with the reps when they visit. Several reps give presentations of upcoming books to the staff too. Always fun. Thanks for visiting the Wickeds, Sarah! One of the things I’ve noticed about independent bookstores is that they do a great job of building a community. They seem to be so much more than retailers. They generously throw open their doors to groups and authors and causes. I’m always in awe of the time and energy they put into all aspects of their job. So how do you do it all? We do try to be more than just retailers. I think the answer to your question is that we have an enthusiastic staff who like to do things. The store has several book groups that different staff members run. 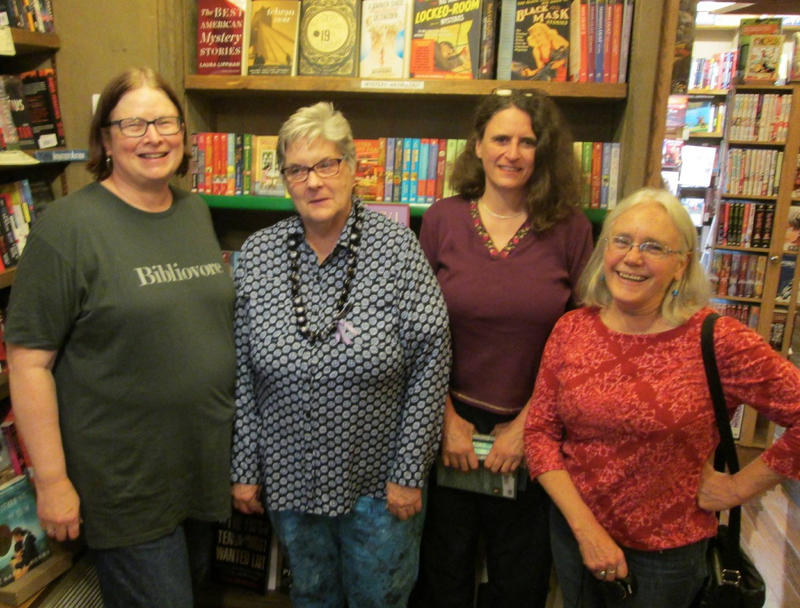 Two mystery groups, a history group, a women’s fictions group and a cookbook group. Several of us are planning an adult coloring book group which we would take turns heading. Also our conference room is used for meetings by local organizations. Yeah, we are looking forward to your visit and meeting you. You mean Sept 17th not Oct 17th? Oh yes, September! Next week– my brain is fried. I have a second leg of the tour in October . . . I was thrilled to hear you had a copy of my book! It always amazes me that someone “found” it! It must be really hard to decide what to order with the wealth of great books out there. Thank you for joining us today! A big thank you to all of you for having me here today. Yes, there are a lot of books out there. It hard and I often ask customers what other authors we don’t have that they would like to see on our shelves. Our cozy readers are especially helpful with their suggestions and often will request a specific series they want to read. Your thoughts on how you use social media to alert your customers about new cozies arriving in your shop. 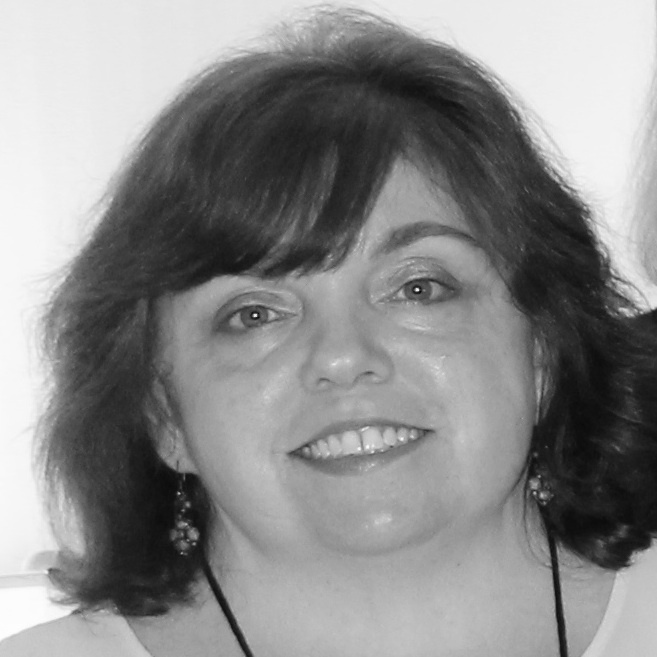 We have staff members who manage the Northshire’s Twitter and Facebook accounts. I can send them upcoming titles for each month and they can post them. Would this be helpful to you? And please if you have other suggestions let me know. Thanks so much for visiting with us today. Now I have another bookstore I want to visit! I was honored to be asked to be a guest. Please, if you visit come and fine me. I so want your job so I can read on the job. Kidding, I’m kidding! Seriously, I love books and trying to sell favorites. I have for years. I’ve often thought a bookstore would be a fun place to work. While I know it is work, you certainly made it sound like fun as well. Thanks for you comments. I think bookstores can be a fun place to work. We work hard and have a lot of laughs too. Thank you for visiting. Glad you like the bookstore. I like to visit libraries especially ones in small towns as often there is some type of local exhibit about the area. What is the best way to get a bookseller to carry the kind of books you want to read, short of begging on hands and knees (I would, but I’d never be able to get back up again)? I’ve tried pleadng and bribing with homemade chocolate chip cookies, but no luck. Problem is book seller has a prejudice against books she considers “genre” fiction, so won’t carry mysteries or science fiction/fantasy that aren’t on the best seller list. .